macaroni & cheese: Hurray! I know you've all been waiting for....DAY FOUR!!!! Hurray! I know you've all been waiting for....DAY FOUR!!!! On Day two, I called my friend who lives in Honolulu so we could make plans to get together. She and I met on Sewing Mamas, and she was super gracious enough to offer to take me around in her car one day. She even found an extra car seat so my kids and hers would all be traveling safely!! She was the best hostess you could ask for! On our way downstairs for some coffee with daddy. I also gave them some yogurt to tide them over until breakfast. There aren't as many pics, because by this point William had broken my camera and I had to use a disposable. I thought MY camera took horrible pics, but HOLY COW!! This thing was terrible!!! After breakfast, (which was delicious!! Good coffee, too! 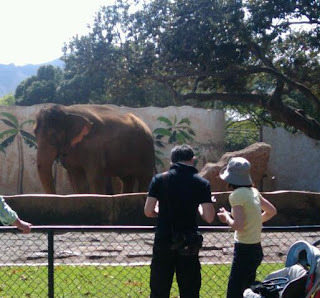 Thank goodness) we headed , on foot, to Honolulu Zoo! My Dallas Zoo membership got me in for half price ($6) and the kids were free, of course. CHEAP!! This was a little over a mile away from our hotel. The first thing we saw were these REALLY noisy monkeys. William loved them. I have a video of them on my phone I'll upload as soon as I figure out how. They were very active, swinging from all their stuff and making REALLY loud noises! It was pretty funny! This was a huge peacock, and despite our best efforts, it would not be startled into showing it's tail. This zoo is really small, but it had FOUR giraffes!! The rhinoceros was in the same pen as the giraffes...it just came charging up the hill as we were standing there. My friend Marilyn, and her kids Alex and Kiani checking out the porcupines. The porcupines. They were so cool!! They had several elephants, too. 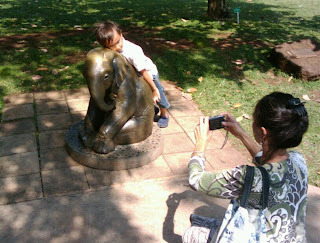 Alex wanted his picture taken on the tiny bronze elephant. 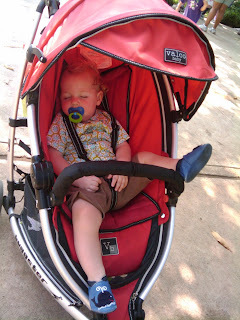 William wanted to stop by the noisy monkeys again on the way out, and he dropped his paci into the mote around them. Oops!!! Those huge gold fish kept attacking the paci, hoping it was food. We watched it for 10 minutes, laughing! William WAS here, I promise!! BUT he was on my back the whole time, so he could see. Aldous was exhausted!!! The boys were so exhausted that they slept for fours hours that afternoon!! !